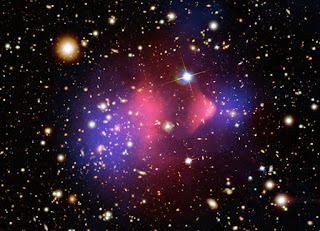 The Bullet Cluster is one astronomical object that proves the existence of dark matter. The Nobel Prize committees don't seem to worry much about popular opinion (or at least my opinion), but if they did I'm pretty sure Vera Rubin and Kent Ford would win the 2015 Nobel Prize in Physics for their measurements that were the first to strongly imply the ubiquitous existence of dark matter in the universe. I'm basing this on things like the buzz I've been hearing from science journalists and the Sigma Xi bracket to pick this year's winner (they find dark matter and planets beyond our solar system to be the two to watch for). There's also a modestly active Facebook page that's been pulling for Vera Rubin since just after last year's Nobels, but since I made the page I don't put much stock in that as a predictor. 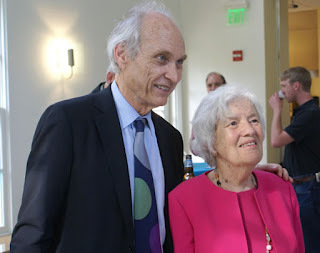 Vera Rubin and former APS President Michael Turner in 2013. One of the best Nobel Prize prognosticators I know, Ben Stein of Inside Science News Service, is betting on dark matter or exoplanets as well (but considering he cited my Facebook page as part of his reasoning, I have to subtract a few credibility points from him this time around). 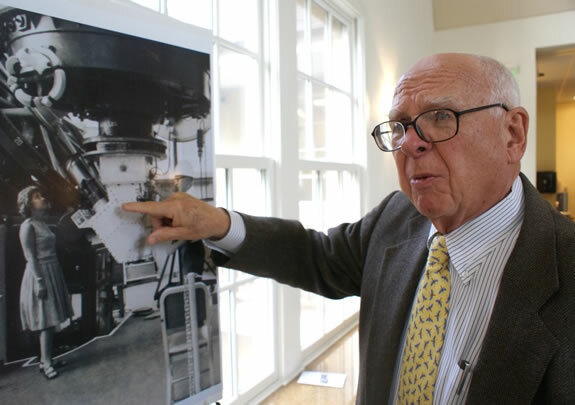 I've also spoken to a couple of well-connected scientists who say they don't know for certain of course, but the Nobel committee members seem shockingly up to date on the history of dark matter. Why would that make a difference? To me it means that the committee at least kicked around the idea of giving it to dark matter researchers and boned up on the history as part of their deliberations. Kent Ford reminiscing about the detectors he built to measure the orbital motions in galaxies. Photo by Mike Lucibella. If dark matter is on the short list and, as Stein believes, physics Nobels cycle through various areas over the years, this may be the last chance for the committee to recognize Rubin and Ford together. She's 87 years old now and would be 91 or 92 the next time they get to cosmological topics again, assuming exoplanets take the prize this year. Ford is a spry 84, but will be 88 or 89 when cosmology rolls around next on the Nobel Prize calendar (according to Stein). I'm not sure how old the exoplanet researchers are, but I think they have a few more years to spare. Nobody knows. There are lots of good guesses, but really dark matter is whatever is causing stars and other cosmic stuff to move around as though there's lots more matter in the universe than we can see. Fritz Zwicky was the first person on record noting the problem, and the first person to coin the phrase "dark matter" to account for it. (If he were alive today, I would put him on the list with Rubin and Ford to share the prize. Unfortunately, the Nobels are not given posthumously.) Although Zwicky was the pioneer, Rubin and Ford proved that Zwicky's observations were not some cosmic anomaly but instead the norm across the universe as far as we can tell. We haven't been able to capture a bit of dark matter yet, or make a piece of it in labs like the LHC. That's not terribly surprising. The reason dark matter is dark is that it doesn't seem to interact except through gravity. But gravity is weak, and finding a tiny bit of something that you can't see, touch, smell or hear is really hard. Even if dark matter particles (assuming they are particles) are really heavy by particle standards, the gravitational forces any one particle exerts would probably be undetectable, particularly because you can't hold one in one place - or even be certain it's there at all. As I see it, if dark matter only interacts through gravity, then it's possible we will never detect it except by looking at the motion of stars and galaxies. A Nobel Prize for Something We Haven't Found?!?!? Come on . . . So why would the Nobel prize go for dark matter if we haven't found any yet, and may never find any at all? A lot of people seem to think that's a problem. Actually, Ruben and Ford wouldn't get the prize for discovering dark matter -- they would get it for observing orbits of astronomical objects that are moving too fast, as though there is more matter there than we can see. So even if they win, don't expect dark matter to be in the Nobel Prize citation. Still, like dark energy, the cosmic motions that might be explained by dark matter are among the greatest outstanding mysteries of modern science. That is a Nobel-worthy discovery. 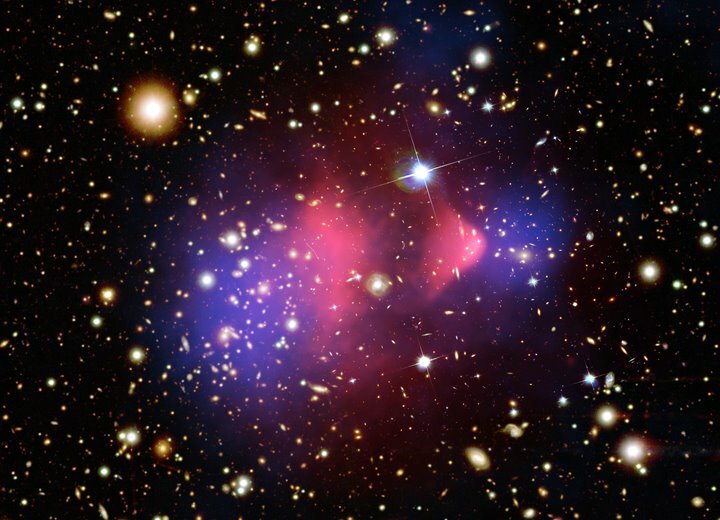 More recently other things, like mass distribution in the Bullet Cluster and gravitational lensing due to dark matter, have essentially proven that the orbital motions Rubin and Ford measured are almost certainly the result of dark matter. So expect Ford and Rubin to share the prize with an astronomer who made those the Bullet Cluster or lensing measurements (I don't know who they would be because I don't follow astronomy much). Will the People's Choice Take It? I believe this is the year the Nobel Committee will recognize Vera Rubin and Kent Ford for their measurements of galactic rotation curves. And if they don't, whatever else they choose is just plain wrong, all things considered.